Award from "Jesus is Lord Forever (Christian Page)"
contained within the image itself, and expanded upon in the "Statement" below. I ask that you link back to my page through the image. all things are possible, and without Him, I am without Hope, Light, Truth or Salvation! If you select one of the following images, it represents your belief in Jesus as the Savior who died on the cross for the forgiveness of your sins and mine, and who arose on the third day in victory over the devil and over death, and who ascended into Heaven to prepare a place for all who believe in Him and who accept the Free Gift of Salvation. Further, you agree, in public, that your life belongs not to you but to Jesus Christ, and that in all your ways you choose His Way rather than any other way this world has to offer, knowing that the Way to Salvation is like a narrow road few will enter through and broad is the Way to damnation which is like the wide road many will choose travel. By accepting this image, and placing it into your Home Page, you are not saved, for we are saved by Faith not works, but rather you publically acknowledge that your Faith has saved you and that this merely represents your willingness to be open about it and not, as is the custom of many, something to be hidden away like a prize one chooses not to share, nor something to be ashamed of even in the face of scorn and ridicule. These images are what I call self awards; that is, you give them to yourself. The reason I ask you to link back to my page with them is to allow others who see the award to come here and choose the award they might like to add to their site. As with all the images on this page, the system is based on honor. that will be posted for visiters to my site. and know your site is well worth the effort of a visit. the smaller image of Award-2C. 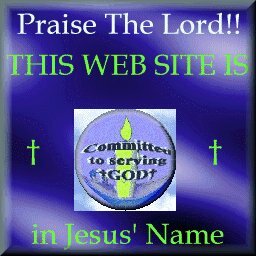 The site must be Christ-centered, either through original works (poetry/writing), or music, or graphics, or Bible Study, or Christian Software, or other Chrstian Organizations (Missions, Churches, Ministries, Outreach, etc.) Please note that this criteria applies only to the image "Award-2C". If you wish to add any of the other images to your site there is no criteria. I only ask that you have a faith in The Lord. Further, if you use any of those images, I ask that you link back to my home page...but you do not have to if you don't want to. If you feel your site deserves this award, or another site deserves it, please e-mail me with the site's address. The graphics in this page were created with Paint Shop Pro. While it is a powerful program, it is not too difficult to learn. It does not do everything I want to do, but I like what it does do. Though I did alter it by copying the blue on the left to the right.